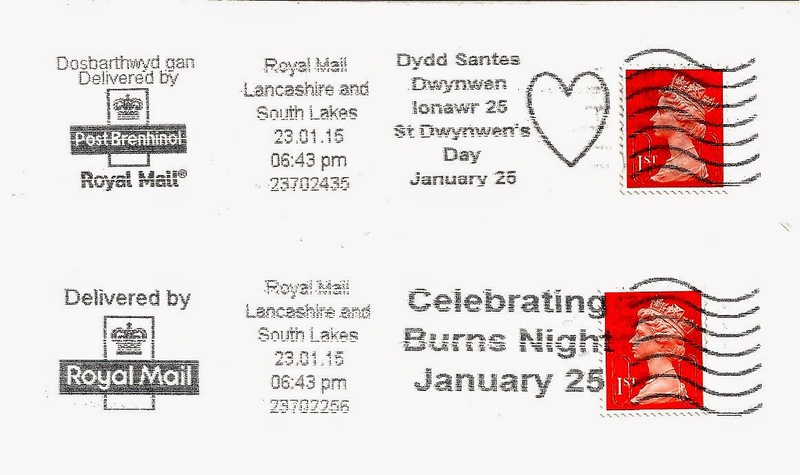 Two slogan postmarks will be re-used at Mail Centres throughout the UK, but only on certain mail. On Wednesday 25 January, a postmark will be used on letters and cards delivered in Wales to celebrate Saint Dwynwen’s day. Saint Dwynwen is the patron saint of Welsh lovers. The Saint Dwynwen’s legend tells of her unrequited love for a young prince called Maelon, and her subsequent life as a nun on LLanddwyn Island, located off the South-West tip of Anglesey. The second postmark will be used on Wednesday 25 January in Scotland to mark Burns Night. Burns Night is an annual celebration in Scotland to commemorate the life of the poet Robert Burns. These are the slogans used in 2015. This year's Burns Night slogan omits the word 'Celebrating' and shows the date as 25 January 2017. The St Dwynwen slogan is in Welsh only, and has the wording between two rows of three small hearts. New pictures will be added if anybody sends one of them. As you can see this was used at Chelmsford's South East Anglia Mail Centre, and as far as I know it was sent to Essex, not Scotland. Another, from Brian, with the other layout, but also used at Peterboroug. I also have a second class Burns one sent from Bristol to Swindon. Posted on the 24th so arrived the day after Burns night - the 26th. It is probably fair to use the Burns Night slogan in England. There are enough celebrations here by exiled Scots ( and other Burns fans ) to make such use legitimate. The Welsh slogan of course is something else altogether.